If you are not able to find the item you are looking for in our standard range below. We are able to offer a bespoke gear cutting service to the modeller. This means that it is now possible for the modeller to have custom gears made to their requirements. Details can be found on the Gear Cutting section of our web site. 2 0.210" [5.33mm] 0.194" [4.93mm] not applicable 2.0mm or 1/8"
'IP' - Intergral Pinion (type 1 only) 15teeth, 100DP and is moulded with the contrate. These gear sets can be used as an alternative to the standard worm and wheel to drive at 90 dregrees. Both gear sets have a ratio of 2.9:1. The Contrate and Pinion are manufactured from injection moulded Nylatron GS. The type 1 contrate has a 2.0mm reamed bore in a Brass bush. All other bores are a push fit on to the indicated bore size. 'GB' - Gear Bore 2.0mm or 1/8"
All helical gears are manufactured from Brass. These special gears are duplicates of the worm wheels shown in the 'Fine pitch tooth range (100 DP)' Worm and Wheel gear sets section. Except they have a LEFT HAND HELIX, which allows them to be meshed with the RIGHT HAND HELIX worm wheels. This gets rid of the need to use spur gears as a secondary drive when space is a problem on width in some applications. DO NOT TRY TO MESH THE WORM WITH THE LEFT HAND HELIX GEAR. 'GB' - Gear Bore (18 Teeth & above) 2.0mm or 1/8"
To calculate centre distances and outside diameters see 'Spur gear calculations' below. The 15 tooth pinion is manufactured from injection moulded Nylatron GS and has no grub screw fixing. Gears with 18 teeth and above are manufactured from Brass. To work out the centre distance and outside diameter for the above spur gears and pinions, the following formula should be used. Add to gether the number of teeth in both gears, then divide this figure by twice the DP the resulting figure will be the centre distance. The centre distance that the calculation returns is for the two spur gears in tight mesh. Some allowance will have to be made for backlash. This amount will vary depending on the tooth size of the gears and the manufacturing tolerances. Add 2 to the number of teeth in the gear, then divide this figure by the DP the resulting figure will be the outside diameter. The outside diameter that the calculation returns is for the gear at its correct size. However, this size will vary slightly due to manufacturing tolerances. Divide 25.4 by the Module(MOD.) size, the resulting figure will be the DP equivalent of the MOD. size. To calculate the centre distance for a 13T * (14T) pinion and a 22T spur gear. The number of teeth which should be used are 14T and 22T, this will give the correct centre distance. If you use 13T and 22T the centre distance will be incorrect. To help you with these calculations, two on-line calculators are available to calculate the centre distance and outside diameter of spur gears. Results are displayed in both Inches and Millimetres. 'GB' - Gear Bore (18 Teeth & above) 1/8"
'GB' - Gear Bore (13* (14) Teeth) 1/8"
'GB' - Gear Bore (14 Teeth & above) 1/8"
These spur gears and pinions have been produced for the smaller scale modeller, but primarily for the 2mm scale. The gears have a reduced face width compared with our standard range. All gears are manufactured from Brass. Worms are manufactured from either injection moulded Nylatron GS or Steel, unless otherwise indicated. All worms are single start unless otherwise indicated. 'GB' - Gear Bore (21:1 & above) 2.0mm or 1/8"
'WB' - Worm Bore 1.0mm*, 1.5mm, 1.8mm, 2.0mm or 3/32"
* Only available in the 0.195" [4.95mm] length worm. TT3 - This gear set can be used as a direct replacement in Triang TT3 chassis. Gear type 1 will be required with a 1/8" bore. All worm wheels are manufactured from Brass. 'GB' - Gear Bore 1/8"
These worm and wheel gear sets have been produced for the smaller scale modeller, but primarily for the 2mm scale. The worm wheels in these sets have a reduced face width compared with our standard range to allow for narrower chassis construction. All worms are manufactured from injection moulded Nylatron GS. 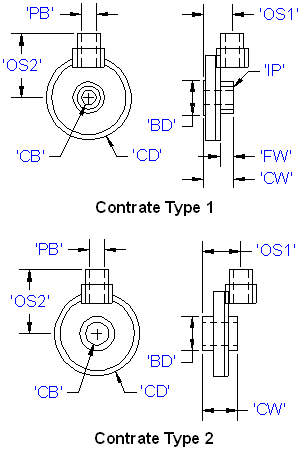 'GB' - Gear Bore 1/8", 9/64" or 3/16"
'WB' - Worm Bore 1.5mm, 1.8mm, 2.0mm or 3/32"
2ST - Indicates a 2 start gear set. TMB - This gear set can be used as a direct replacement in Triang motor bogies. Gear type 1 will be required with a 9/64" bore. THSL - This gear set can be used as a direct replacement in Triang/Hornby steam locomotives. Gear type 1 will be required with a 9/64" bore.